Back in early 2015, Moz announced a new project from their research and development department, called Mox Spam Score. 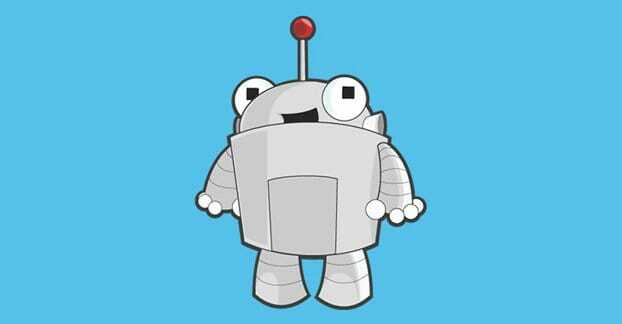 Since then, it has been rolled out beyond the scope of a minor test and into part of the Mozscape API. Spam score is an analysis created by Moz based on deep study of Google and the rankings of sites in their massive index. They came up with a list of seventeen factors that, if present on a site, were indicators that the site might be penalized as spam. 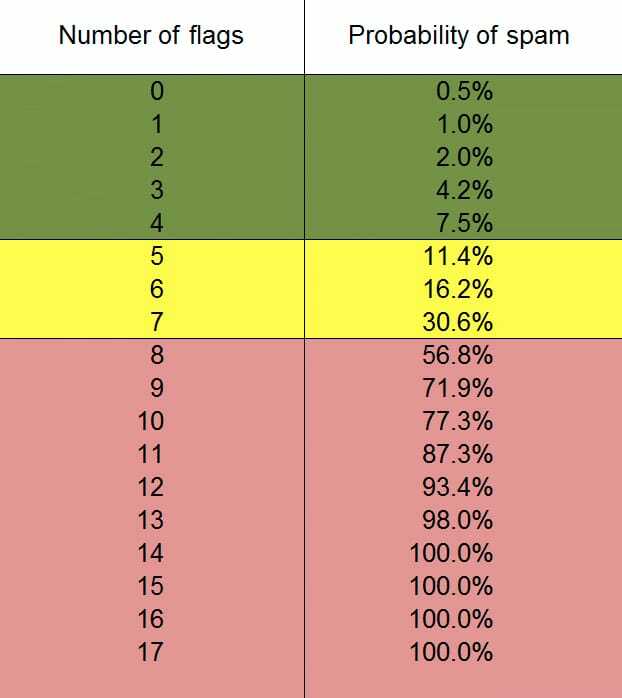 They call these 17 factors their spam flags. Checking your Moz spam score is trivially easy. All you need to do is plug in your URL into the Moz Open Site Explorer. This shows you all of your moz metrics, including your Domain Authority, Page Authority, and Spam Score. They also give you a hint of what your spam score might mean. For example, a spam score of 6 is potentially troubling. Moz found that 16% of sites with a 6/17 rating were penalized by Google during their monitoring. Open Site Explorer will also tell you what some of the flags are, when you hover over them. For example, one site I tested had a 1/17 spam score rating, and the 1 flag was not having contact information visible on the page. One thing to note is that each of the 17 flags were roughly equal in terms of how detrimental they are. There’s no weighting to the flags, and no preference in which you should fix first beyond ease of accomplishing the fix. Spam Score is also a subdomain-level metric. It’s not broad enough to be entire domains, but neither is it granular enough to be on a per-page level. If you want more information about your spam score in OSE, you can click over to the “Spam analysis” tab on the sidebar. It is, however, a feature that requires a Moz Pro account. That account can be had for $99 per month, though you can start a free trial and use it for 30 days. 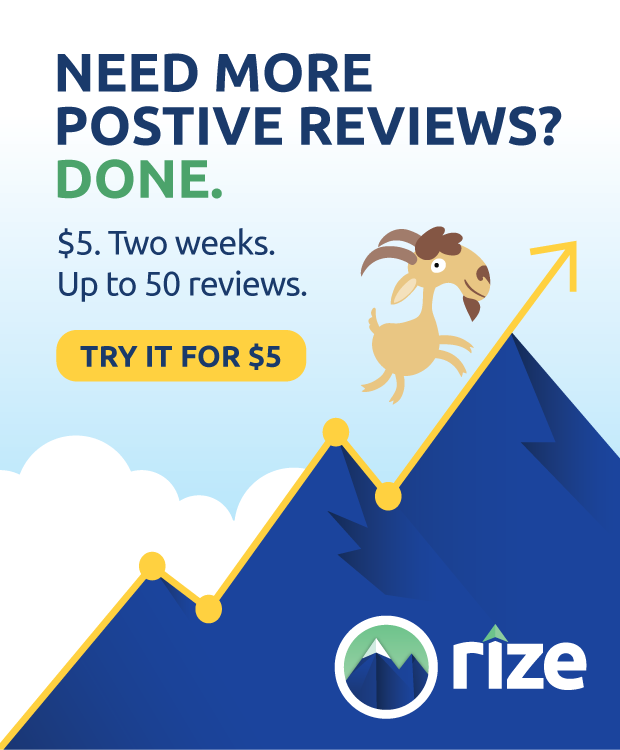 If you’re just auditing your site, I recommend getting the free trial and giving it a shot. There are so many features that you can certainly get some great mileage out of it. What I’m going to do now is spoil things a bit and simply list each factor and how to fix it. As I said, there are seventeen in all. I will also say now that if you only have 1-3 spam flags, you don’t necessarily have to worry. 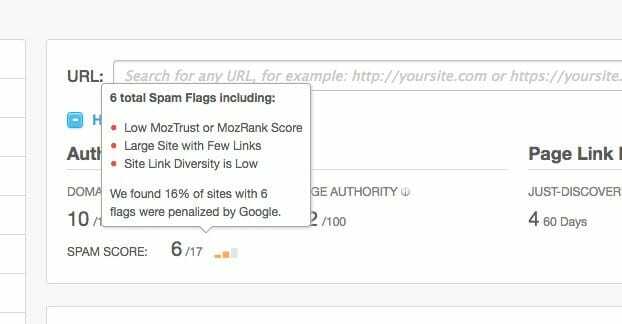 Even large, reputable sites have spam flags, and even Moz itself has them. It’s only when you get about 5 that things need attention. A low ratio of MozTrust to MozRank. If your MozTrust is low compared to your MozRank, you should take action to raise it. So what is MozTrust and how do you raise it? It’s the Moz link trust score. Think of it like Majestic’s TrustFlow. Links from highly valuable and highly trusted sites will increase your trustworthiness. Meanwhile, links from untrusted sites will hurt and bring down your trust. So, what you want to do is get more good links and remove the bad links pointing at your site. Thankfully, you get an analysis of your backlinks in Open Site Explorer as well, and can export, comb through, process, and disavow those links. An unusually low number of links for the size of the site. A site the size of, say, Forbes, would be expected to have a huge number of incoming links. If a site springs up with thousands of subpages, blog posts, and so forth, but it only has a small handful of backlinks, it looks suspicious. Huge content productions don’t spring up overnight. This is also a pretty simple one to solve; just get more good quality links. An unusually low link diversity. Sites should accumulate links from a variety of sources. If you’ve been focusing your link building efforts primarily on, say, wikia sites, the low link diversity is going to hurt you. Even if you have a ton of links, they’re all coming from the same place, so you see severe diminishing returns for them. It’s better to build links from other high quality sites than it is to build more from the sites you have established reputations with. and 5. An unusual ratio of followed links compared to nofollowed links. There are two different flags here, one for subdomains and one for domains. The problem is sites that have an unusually high percentage of followed links compared to nofollowed links. Nofollowed links are increasingly common on the web. They come from social media, from blog comments, from forums, from wiki-style sites, and from a wide variety of blogs that like to nofollow most of their outgoing links. 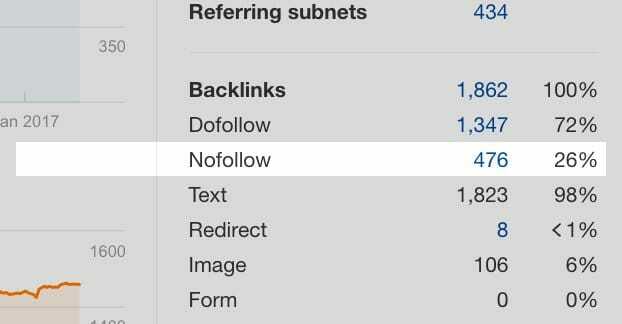 If your site has a high percentage of followed links compared to nofollowed links, it gives a bit of insight to Google. Specifically, it tells them that you’ve been focusing on acquiring followed links to the exclusion of nofollowed links, hoping to get extra SEO value out of them. This is liable to backfire on you. The solution? Just get more nofollowed links, and stop caring so much about whether the links you get are followed or not. As with most things in SEO, the more finicky you get with minor technical details, the deeper you get into spammy and black hat territory, and the more likely you are to shoot yourself in the foot. Unusually few links with branded anchor text. The idea here is that a lot of people linking to a site are going to do something like “see this post over at Moz” and link to the post on Moz.com using “Moz” as the anchor text. This happens to every brand, to every site, as long as that site has a brand. The trouble is, over-reliance on links with the same anchor text is a known indicator of link spam, so people who dig into artificial link building take great pains to use a wide variety of different anchors for their links. They tip over to the other side of the scales, and the branded nature of their links gets lost. The absence of something is just as telling as the presence. Thin content. This one should come as no surprise in the post-Panda era, but thin content is still a problem. The way Moz measures it is a relatively low ratio of content compared to navigation and other surrounding material on a website. I always recommend keeping your blog posts at least 1,000 words, though 1,500 or even 2,000 is a better baseline. Anything under a thousand is likely to count as thin content. While a few pieces of thin content on your site isn’t going to be a deal breaker for Google, it’s still a warning sign and can compound with other flags to hurt your site. Excessive external links. This is more of an issue with pages that monetize their links, but it can look spammy for a number of reasons. Remember the old “topsite” business model, where a site would have a top 200 list of pages, ranked by some arbitrary metric, with preferential treatment given to the ones that paid the most to get on the list. Those sorts of sites were more links than content, and are obviously the target of some demotions because they don’t provide anything useful to the web at large. Thus, excessive links as a spam signal. This one is of course easy to solve; cut down on your links per page. Very few internal links. Internal links are the sign of an organic site. Often you will want to reference other pieces of content you have published, and so you link to them. Blog posts should, in my opinion, always have at least one in-text link to another page on your site. You can also use widgets for related posts to display other posts on your site, though these may not count towards your SpamScore because they are interchangeable with advertising. Excessive anchor text. Some sites fill their content with links, so much so that it’s actually harder to find somewhere to click on the site that isn’t actually a link. This is often a huge sign of spam. It also ties into excessive links, so minimize both your links and the number of words in your anchor text. Unusual or hidden external links in the navigation. Spam sites often try to hide spam links in their navigation, particularly in sidebars or footers. Avoid this by keeping your external links to small sections clearly labeled as external links. A “our web partners” section fits the bill, or any link that is clearly labeled. Minimize them, as well. A lack of contact information. In this case, contact information doesn’t just mean a name and address, it can be a wide variety of pieces of information. Social media accounts, phone numbers, contact forms, mailto links, all of these are valid pieces of contact information. Spam sites tend to avoid any association with their owners, to avoid reputation issues, so they lack contact information entirely. Very few pages. Microsites are viable in some edge cases, but a lot of the time they simply don’t have enough information on them to warrant being ranked highly or at all. Brand new sites will obviously have a bit of leeway, but old, established sites with only a handful of pages will cause Google and Moz to wonder why that is. A potentially spammy TLD. Some top level domain extensions are spammier than others. According to Spamhaus, the actual top ten most abused TLDs are .science, .top, .gdn, .us, .stream, .click, .biz, .download, .study, and .accountant. This is based entirely on percentages, however, so while .study may have a high rate of spam, it’s only because their index has only seen fewer than 600 sites using the domain. In any case, you almost always want your site to be on a .com domain regardless. Excessively long domain names. This is part of the ongoing struggle against exact match domains and keyword stuffing in domain names. Don’t include keyword phrases in your domain or subdomain. Unusual numerals in the domain name. Some sites are fine with numbers in their URL, like Business2Community or 99Designs, but have several numbers, particularly random numbers at the end of a URL, indicates that it’s a potential spam site and that the domain is automatically generated and registered. Finally, one last note. As written here, Moz doesn’t actually keep their spam score database up to date very often. It’s entirely possible that you can fix a problem but it won’t be reflected in the spam score in Open Site Explorer, simply because they have not reindexed and reprocessed the data. Remember, Moz may be a big company, but they’re no Google, and they don’t have the infinite processing power required to monitor what Google does. Both the metrics and Google’s response to them can change from time to time and you won’t see it reflected in the score. Simply use your score as a baseline and make changes as necessary, but don’t worry about the number after that.